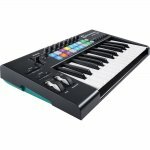 Launchkey is the easy-to-use MIDI keyboard controller. It’s the quickest and easiest way to produce and perform electronic music because it is designed specifically for that purpose. Launchkey is the easy-to-use MIDI keyboard controller. It’s the quickest and easiest way to produce and perform electronic music because it is designed specifically for that purpose. Just plug in via USB and the keys, faders, knobs and pads immediately spring into life, giving you hands-on control of your grid, instruments, effects and mixer.